The Caucasian male version of "how the West was won" is usually depicted as a combination of brazen machismo and dazzling sharpshooting that provides safe haven from the likes of Native Americans, Mexicans, cougars, and coyotes; but there is another, albeit female, version to this Caucasian point-of-view, and it goes much as pioneer life in all its hardships is depicted in Quilters. 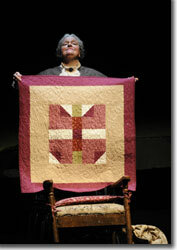 Told in 16 blocks—each representing a particular piece of a larger quilt or tapestry of the lives of heartland women, and filled with songs that capture their hopes and dreams, fears and sorrows—Quilters brings home the impressive resolve of the unsung heroines of the frontier. Director Penny Metropulos reconceives Molly Newman and Barbara Damashek's 1983 DCTC world premiere on a wide-open swath of prairie (William Bloodgood's lovely green patchwork) against an endless horizon (Don Darnutzer's stunning skyscapes), strengthening the flow and throughline of the episodic script. Add Craig Breitenbach's evocative sound design and the moods move easily from sublime (on the porch during a summer's evening) to earth-shattering (the tornado sequence). Metropulos also adds a male actor to the mix, freeing the female characters from play-acting and giving credence to family events. 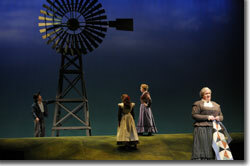 Damashek's music and lyrics, including some period poetry and spirituals, are brought to fruition in harmonies and solos by each member of the ensemble, who capture the broad and deep range of emotional life in the territories, universalizing the plight of settlers in a hostile and unforgiving land, while exploring sisterly, motherly, and daughterly perspectives. 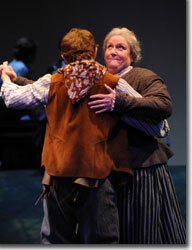 The Denver Center Theatre Company's production of Quilters runs through July 12th. 303-893-4100 or denvercenter.org.